All too many people are entirely settled in their opinion that Norman Rockwell’s art presents a “falsification” of reality: in short, he is charged with utopianism. This opinion is false, but nearly universal. Now, as it happens, the most common complaint about distributism too is its supposed utopianism. Also, I think, false. Rockwell’s art is supposed to be utopian because it depicts events that are free from suffering, death or evil — a whitewashed world that never was and never could be. Distributism is supposed to be utopian because it requires people to be free from avarice, or else it requires the oversight of a powerful centralized state, the existence of which it rejects. Or something like that. Anyway, it’s not possible, and its advocates, especially Chesterton, are completely ignorant of the Science of Economics. I’m on something of a mission to rescue Rockwell from the critics. As always, you can find many critics who simply hate his “falsifications.” Nowadays, you can also find quite a few critics who admit to liking Rockwell. These critics find his “falsifications” praiseworthy in one way or another. But they fully accept the “falsification” business. I loathe the charge — I loathe it when it’s made against Rockwell, and I loathe it when it’s made against Chesterton. I think it is cheap and facile and unreflective. And I am hoping to find something of a sympathetic ear here, among those who see the falseness of the charge when leveled against distributism. In this little article, however, I will not attack the falsification charge directly. Rather, I will take an instructive recent sample of Rockwell criticism and show how thoughtless it really is, all the way down. Occasionally, however, critical claims are easy to falsify. 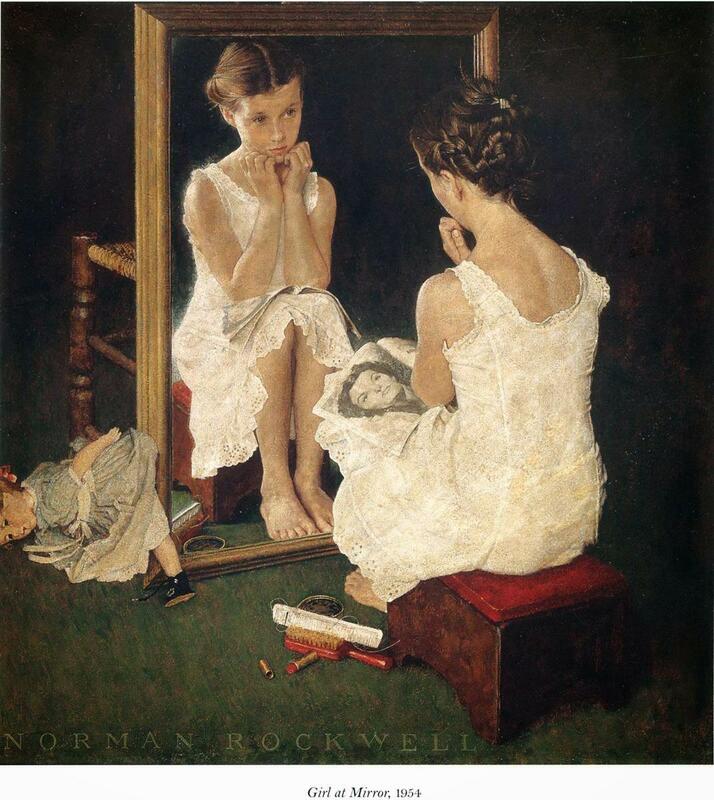 Norman Rockwell’s critics, for example, have always said simply unsupportable things about him. (I address some of that in various places, such as here, here and here.) Unsurprisingly, they are still at it. The bizarre, indefensible claims about Rockwell’s work continue unabated. The most recent offender is the Tampa Bay Times‘s Lennie Bennett. In a review of the traveling Rockwell exhibition on display in Tampa, Bennett writes about Rockwell’s 1960’s civil rights pictures, such as “The Problem We All Live With,” and contrasts them with his earlier, happier, Saturday Evening Post pictures. The problem critics allege in his newly expressed social conscience is that his works aren’t as good as those about the good old days. We know as we look at his earlier works that we’re looking at a world that was mostly fiction. But how much truth is there in a 17th century Rococo painting by Fragonard of always young and gorgeous aristocrats either? We know that Rockwell was a commercial artist who painted for paid commissions. Do we think that Renaissance artists painted for free or always chose their subject matter? The difference is that Rockwell never seems to stretch himself the way a great artist does. He avoids nuance and the complexities of relationships. The inner life holds no interest for him. Some of this is simply opinion, and I have no particular objection to it. In fact, I agree that most of Rockwell’s civil rights pictures aren’t all that great. (Although I recently stumbled upon a very nice blog post about “The Problem” that does a beautiful job of trying to explain the picture from a technical standpoint. It made me like the picture a little bit more.) It’s the last sentence that is completely, wildly, indefensible. The inner life holds no interest for Rockwell? Where could that possibly come from? More on that in a moment. The second-to-last sentence is also indefensible, despite the fact that (I would guess) it probably strikes most readers as true — even as obviously true. It probably strikes most readers as obviously true because it’s the kind of thing that is said so often about Rockwell. But the fact that it’s often said doesn’t make it true. To know whether it’s true, you’d have to do something — you’d have to look at a whole bunch of Rockwells, carefully. You might also need to say a bit about what ‘nuance’ and ‘complexity’ actually mean. When you say he avoids nuance, do you really mean he avoids ugliness? If so, you may be mostly correct. But if you mean the pictures are hamhanded or just simpleminded, then you’re completely off base. This picture, “Breaking Home Ties,” doesn’t depict nuance or complexity in the sense of ugliness — this relationship isn’t “complex” in the sense that the pair obviously loathe each other and can’t wait to part. If that’s the kind of nuance you want, you’re largely going to have to look outside of Rockwell. But the picture is, for all that, tremendously insightful. The father, holding his son’s hat, has been working and praying for years that his children will have a better life than he’s had. And now the son is off to college — success! But of course, it means his son will be leaving him behind. And the son is eager to go. It’s such a bittersweet picture, stunningly executed. The fact that it’s a common scene — one that many of us have lived through on at least one side, if not both — takes nothing away from its depth. 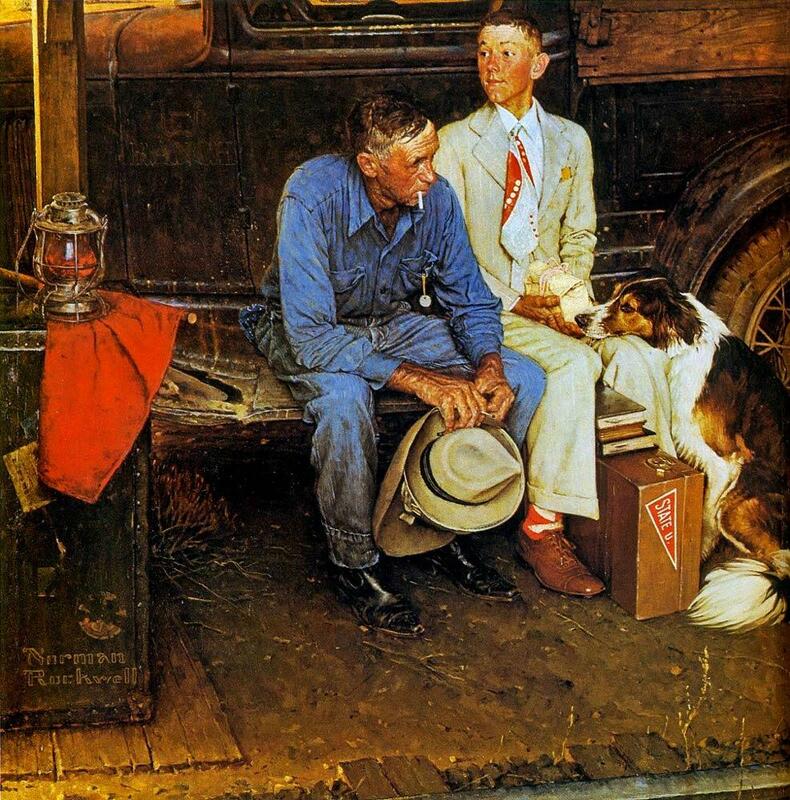 Indeed, it’s Rockwell’s genius that he sees the depth in these ordinary scenes, and helps us to see it, too. So I think we can safely dismiss the tired, silly idea that there’s no nuance or complexity in Rockwell. I weighed in on the trajectory of his career after seeing an exhibition of his work at the Orlando Museum of Art in 2008. I realized two things then that I still believe: An appreciation of Rockwell’s native talent is only possible after viewing his original paintings, which were not seen by the public for years, and that appreciation has its limits. The bits I quoted earlier, about the lack of interest in the inner life and so on, those are the parts where Bennett lays out her case for his limits. So the argument of Bennett’s review is straightforward: Rockwell’s pretty good, but he’s not a Real Artist like Fragonard, because he had no interest in complexity, nuance, or the inner life. But that’s just false. Bennett’s put-down of Rockwell is typical: it is based on her own fantasies about the work, rather than the work itself. You might think I’m being a bit harsh. But this is not Bennett’s first attempt to write about Rockwell. Just above, you see that she mentions a 2008 piece. But more recently, she wrote a generally fawning review of Deborah Solomon’s ridiculous biography of Rockwell, which began with the claim that Solomon’s is the first “comprehensive” biography of Rockwell. False. Laura Claridge had it beat by more than a decade. Bennett also spoke of a “new connection” that Solomon had made — linking one of Rockwell’s apparently playful Post covers to Mary Rockwell’s alleged abortion. Solomon did indeed speak of this. So did Claridge, from whom Solomon swiped the idea and the story without attribution. That is the standard to which our Rockwell critics hold themselves. And apparently, employers like the Tampa Bay Times are satisfied with it. But the larger point here is the point with which I began — the falsification charge. If you were looking carefully, you saw it in a snippet I quoted before: she said “We know as we look at his earlier works that we’re looking at a world that was mostly fiction.” As I said, this charge is made by virtually every critic of Rockwell I have ever encountered, and in fact Rockwell himself sometimes comes dangerously close to expressing it. If the standards of our art critics are as low as I’ve hinted in this piece, that ought to suggest to you that perhaps even the falsification charge is … false. (Hint: it is.) Rockwell is not a falsifier — he’s an optimist in Chesterton’s sense, and as such there’s a lot more to him than our critics have ever bothered to see. Previous articleWas 1964 the Most Important Year — Ever? Norman Rockwell is not an optimist. His paintings do not depict the future — they are embued with nostaligia for a past that never existed. Norman Rockwells paintings show viginettes of the world. They show a past “that never existed” is kind of silly. They are not complete life stories, for crying out loud. They show moments in time. Rockwell knew what bad things were. He lost a lot of money once to a fraudulant invester his first wife invested in. His studio, filled with needed and valuable costumes and objects, burned down, etc. I have known several “Rockwell Moments” in my life. Everything good has to be smudged and smeared. He was not Da Vinci, so what. My favorite artist is Winslow Homer. During the Civil War, while other artists where showing battle scenes, Homer painted quiet camp scenes. Quiet points of time between the awful violence. They were just as real as the battles. You have expressed the general view of Rockwell–one that I find entirely indefensible despite its near-ubiquity. Thank you for the reply. I, too, am a Winslow Homer fan, though I would have to say my favorite is Fra Angelico. On the other hand, I’m not at all convinced that Fra Angelico and people like Leonardo or Rembrandt were actually pursuing the same trade.